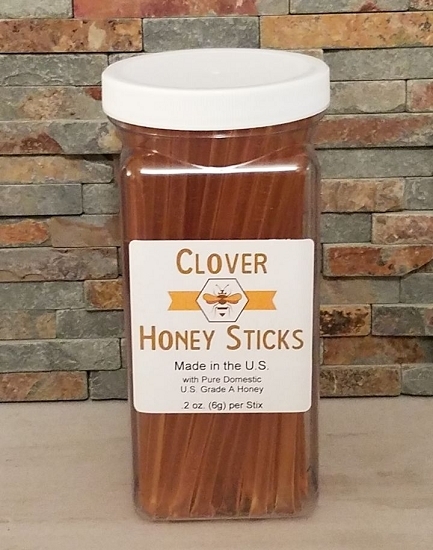 If you are looking for Honey Sticks that are a traditional honey stick - it is Clover Honey. 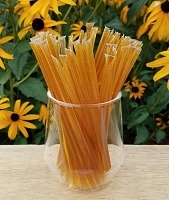 Clover Honey Sticks (also know as honey stix or honey straws) are 100% natural, Grade A clover honey, packed in straws. To open them, just bite or clip the heat seal at one end, and then just squeeze the honey into your mouth. Clover honey sticks are certified Kosher. Kosher certification is by the Orthodox Union - Union of Orthodox Jewish Congregation of America, New York. 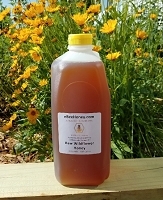 Clover honey is what most people think of as being typical honey flavor and color. It is widely used “on the table.” Despite being the most common nectar producing honey plant, Clover honey is still a variety. White clover, and white and yellow sweet clover plants are the most important for honey production. Depending on location and source, Clover honey varies in color from water-white to extra light amber and has a mild, delicate flavor. I bought 100 clover stix to share with all my fellow tea drinkers at work and it was a huge hit! Lots of fans! 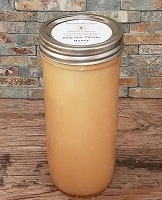 This honey is a great remedy for sore throats, local allergies, and delicious! I shared the website with my co workers, can't wait to see what flavors everyone orders!!! I bought 2 packs of 100 clover honey stix. I used 100 at a 2 day show and sold out the first day! I don't seem to be able to pass through where they are kept without sneaking one for myself - lol. They came very well packaged. I bought the honey sticks to use in gift bags for my daughter's bridal shower. 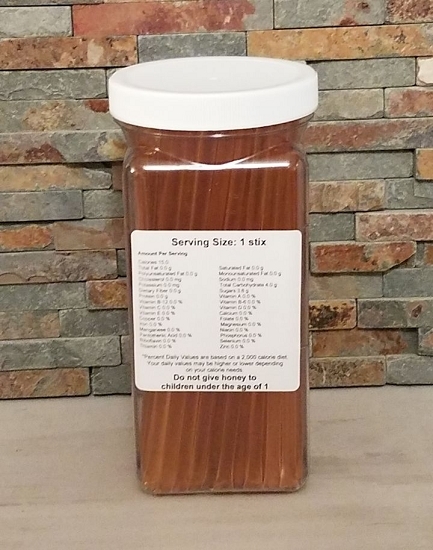 I was pleasantly surprised to receive a phone call from eBee Honey advising me that I could reduce my shipping charges. The sticks arrived in excellent condition, and very quickly, and will be perfect for the shower gift bags for my guests. Thank you! Love these honey sticks. Great tasting and convenient. Honey Love! Always arrives timely, always exactly what I ordered, the students love the honey stix!!! I've tried different brands of honey stix, and this one by far is the best, I've already ordered three time. The clover is my favorite. Will be buying more in the future. Love these, all flavors. Grandchildren can not get enough of them.I love having them on hand, so handy. Delicious. Thank you. Honey is a key element of the Jewish New Year. We find these sticks super convenient to hand out to our students to wish them a sweet New Year. Wonderful! I will be placing additional orders! Super convenient and easy to use. Tastes great!!! We loved the clover honey stix! We ordered 3200 clover stix for a bee themed marketing delivery and not only did we receive the stix just a few days later, but the company also offered to save us money on this bulk order. Great company, and great & helpful people! These were for gifts for school students on a field trip to learn about protecting pollinators in the wild. This honey is delicious and makes a sweet addition to my daughters Bridal Tea Shower goody bag. I am putting them in Easter baskets. This is my second order and I can tell you they are loved by my family. I will continue to purchase. Absolutely delicious! Baby shower was Winnie the Pooh theme and we had honey jars, these honey sticks and several other honey items and these were the hit! Loved them! I ordered these to make wedding favors for my son's wedding. They were shipped super quick! The quality of the honey was first rate! I would definitely buy from this company again in the future. I was so appreciative that you were able to send the kosher certificate. And the honey is delicious as well! These will be used for our health fair, our Styx will promote the benefits of natural honey! These honey sticks are awesome! I have not used this product yet because it is being given out as a complimentary gift for an upcoming church function. I will say how easy it was to order and that it came in a very timely fashion. If I ever need to order these again I would definitely order from you again. We have really enjoyed the clover honey stix. They have good flavor and are good for kid snacks, 72 hour kits, and 1st aid kits for diabetics and for wounds. Might have to hide them from the kids to have them last! I purchased the Clover Honey Stix to use at my future daughter -in-laws bridal shower. The shower theme is a Tea Party so a couple of the stix will be given to each guest with a couple other items as a party favor. I am thrilled to share these as they are very cute and handy to have. eBeeHoney.com was so easy to use and the delivery was very quick. Our shower quests will be asking where I got the honey stix for sure. Very satisfied! Great sticks! not sugared. Like the fact that they are so close to home. I recieved a confirmation email that my order had been placed followed by my shipping info almost immediately after placing the order. Fast shipping and great prices. Would highly recommend! Our daughter is getting married August 2nd. Their song is "Southern Girl". We realize it is not Tupelo Honey, but it is delicious. This is my third order from eBeeHoney.com. The quality of the product has been excellent every time. My children have started eating the honey before and during all their sporting events and have many of their teammates requesting it as well. I use the product daily and would recommend it to anyone that needs/wants a quick and health pick me up. These honey sticks taste great, are packaged well and arrived quickly! 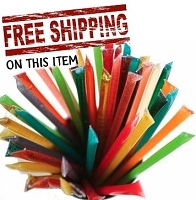 There are not any stores in my area that sell honey sticks anymore, and it's great to be able to buy them easily online and have them delivered. We use these during labor for a quick pick-me-up (I'm a doula). Thanks so much! Great portable addition to sweeten your tea! Love them! 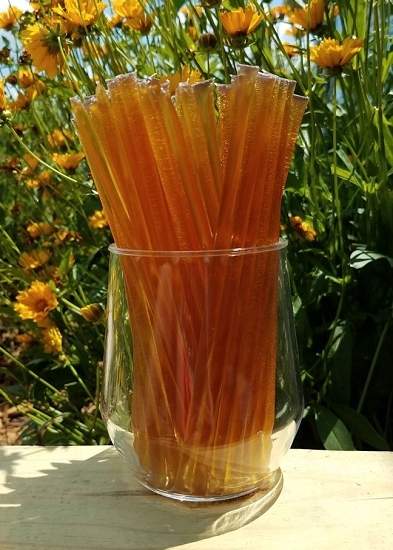 We use these honey sticks in our breast cancer baskets and they are a perfect compliment with our herbal teas. Clover honey is exactly what I think of when I think of what honey is supposed to taste like. The honey sticks are awesome--such a tasty little treat for all ages--my grandkids love them. For gifts, I often give coffee mugs (but not empty ones!) --among other things, some honey sticks and a couple of individually wrapped biscotti in the mugs look very appealing. I purchased 250 honey stixs for a baby shower. The order was delivered quickly. Product was carefully packaged and tasted great. I would recommend this site to anyone. I will order from them again. I bought this as a sweet favor for my daughter's wedding. It arrived very quickly, in perfect condition AND was the BEST PRICE I found. It was a hit!! Great Product! !